Personally, I think the purpose was to show two things: One, "More powerful than you can ever imagine" - that was the promise of ANH that we never fulfilled until now. Also, considering how TLJ ends, shows that Luke will be too. And, two: to show that the Jedi who reach Force Ghost phase do not stop learning. We saw it in books, Qui-Gon who wasn't able to appear to Yoda, but was present as only the voice in RotS, appears as Force Ghost to Obi-Wan in the story Master and Apprentice, during the events of ANH. It took him years, but he did it. Very small number of people in the audience read SW books, so demonstration in the movie does the job. Personally, I think the purpose was to show two things: One, "More powerful than you can ever imagine" - that was the promise of ANH that we never fulfilled until now. Also, considering how TLJ ends, shows that Luke will be too. And, two: to show that the Jedi who reach Force Ghost phase do not stop learning. We saw it in books, Qui-Gon who wasn't able to appear to Yoda, but was present as only the voice in RotS, appears as Force Ghost to Obi-Wan in the story Master and Apprentice, during the events of ANH. It took him years, but he did it. Very small number of people in the audience reads SW books, so demonstration in the movie does the job. Foreshadowing the burning of the Jedi tree with chiaroscuro and the gold star drawing? In TFA after the fight, they got separates by the Force and Rey entered the Falcon. In TLJ they got separated by the force again, but this time Rey is already on the Falcon. Perhaps in EPIX they will unite on the falcon? Or maybe he’ll be the one in the Falcon and her outside seeing him depart, like a farewell... for now. Rey: I don’t hate you. Yes, I too think Rey and Kylo are meant to join "Forces"! They both need to see themselves and eachother as both teacher and student! Rey is holding onto the wrong thing for the right reasons (Holding onto the past [The Jedi-way for example] from a point of hope and consrtuctiveness) and Kylo is looking at the right things for the wrong reasons (Letting go of the past from a place of fear and thinking destruction is the only way to make room for something new!)! Together they can achieve Balance and build something on which the Future can rest assured! 1. Even after my first viewing, I loved TLJ, saw many of the nuances and foreshadowings... however, it is hard to see anything, when one is blinded by ignorance and prejudice! 2. Because they don't understand... and that scares them! The only way they know to cope with that, is to lash out at anyone who seems to lay bare their ignorance and insecurities for the world to see! I pity them in the most loving way I can. GL himself has stated on many occasion that he made use of the Ring-structure troughout. In Episodes, the Trilogies and it is therefore only suitable it is also used for the entire Saga. He was insired by saturday-afternoon matinées and Kurusawa-movies, with all it's storytelling structures, symbolism and foreshadowings. The ring-structure (rondo-theme in music) is a well known storytelling structure, often used in both! I'm fairly sure it is! To my mind, Star Wars has always been multi-layered. There's the obvious meanings and the hidden, more subtle meanings. Yoda's Force-ghost-powers also bears a foreshadowing of what Luke might be able to do as a Force-ghost. Though we have reasons to believe that Rey rescued the books beforehand, I think that had more to do with Luke needing to let go of the fear of losing the "Ancient Jedi Texts" and instead concentrate on the living Force! I think Yoda had already foreseen that Luke would reconnect to the Force and sacrifice himself to save the sperk of Hope! He just needed a little nudge in the right direction (as per usual...)! I really should start reading the books... downside is, there are already quite a few of them and they don't come cheap! Funfact? 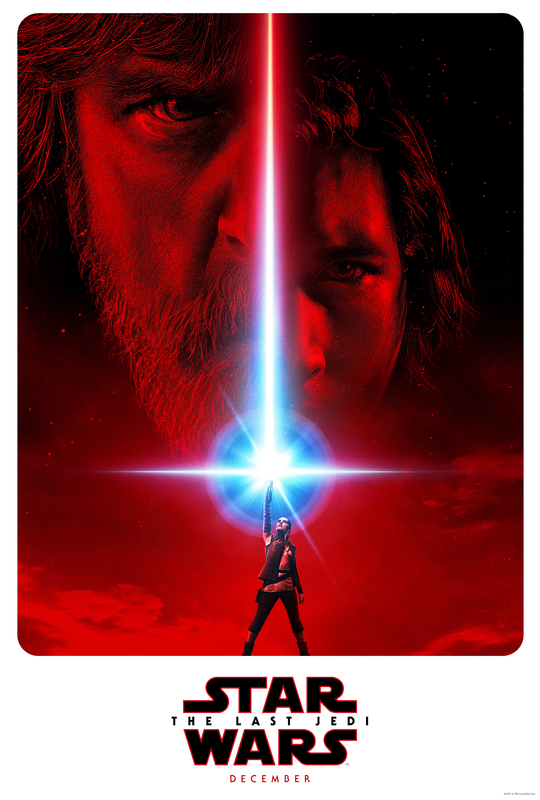 See how both Rey's lightsaber and Kylo's are suggested to be combined in the TLJ poster? I love just how multi layered this Star Wars is. On one hand it's just popcorn-entertainment, it's also a good way to teach children the diffrerence between right and wrong (In my youth, I took a lot from SW to build my moral compass!) and for the adult audience who are open to it... it's also thought-provoking! It shows the brilliance of GL's original concept! I know, it has happened to me more than once! I just thought it was kind of funny considering the subject matter and all the frisky Reylo fan art... I imagined it was an accident too.